Tom Varney is a former psychotic criminal who later found God and devoted himself to serving his fellow man. In a strange twist of morality, this led to his life’s work: shooting wild dogs. The Australian wild dog, weighing in at 15-25kgs is a hybrid of the native dingo and larger domestic breeds. The resulting super dog is bigger, smarter, and much more vicious. Roaming in packs, wild Australian dogs are at the top of the food chain, they hunt and scavenge native kangaroos and wallabies, and they’ve been known to massacre entire flocks of sheep and animals as large as horses. These wild dogs cause millions of dollars in damage each year, while animal control agencies favour trapping and baiting them, farmers argue that nothing is as effective as a bullet to the head. That’s where Tom comes in. He’s pretty much retired now, but his methods (including his ability to call dogs up to him by mimicking their howls) have formed the blueprint for a new generation of dog hunters. 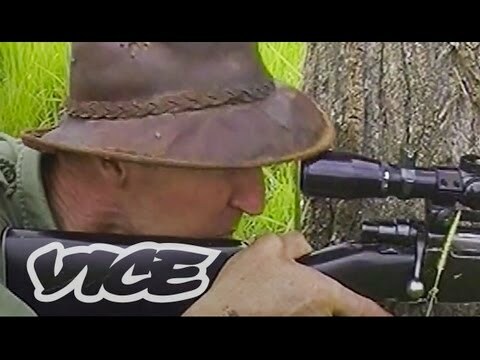 Hannah Brooks from VICE Australia sat down with Tom to talk shooting, howling, and who’s more bloodthirsty: wild dogs or YouTube commenters.